Fig. 4. Comparative mean responses to 1.0 ^g/kg GHRH(1-44)NH2, GHRP-6, GHRP-1 and GHRP-2 in normal young men. Reproduced with permission from ref. 64. The results of a continuous infusion of GHRP-6 for 36 h to normal young men are recorded in Fig. 7 and demonstrate that the GH response to GHRP is both sensitized and desensitized (50). 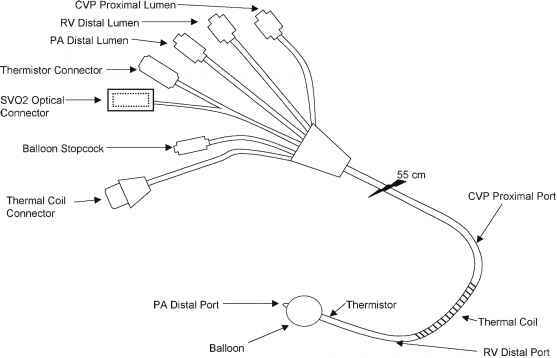 The amplitude but not the frequency of the spontaneous GH pulses was increased during the infusion. Near the end of the infusion, the GH response to iv bolus GHRH was increased while that of iv bolus GHRP-6 was almost completely inhibited. Fig. 5. Comparative mean GH responses to 300 ^g/kg oral GHRP-6, GHRP-1, and GHRP-2 in normal young men. Fig. 6. 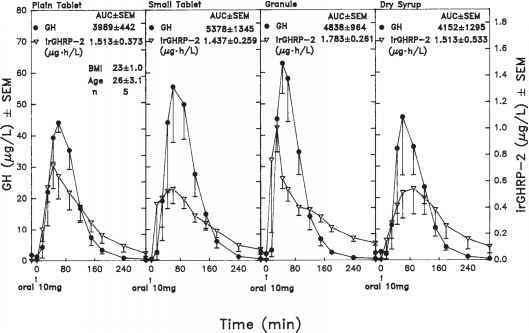 GH and GHRP-2 concentration time-profiles after different formulations of 10 mg GHRP-2 orally on different occasions to the same five normal young men. Values are the mean ± SEM. Fig. 7. Effect of continuous 36-h infusion of saline or GHRP-6 in normal young men. Reproduced with permission from ref. 50. Fig. 8. 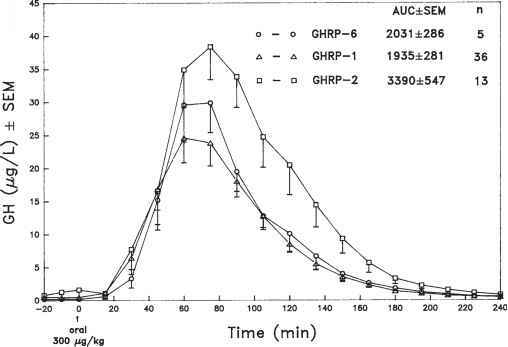 Effect of a very low dosage of GHRP-2 (0.03 ^g/kg) combined with a high dosage of GHRH (1.0 ^g/kg) on the synergistic release of GH in normal young men. Reproduced with permission from ref. 81. Fig. 9. 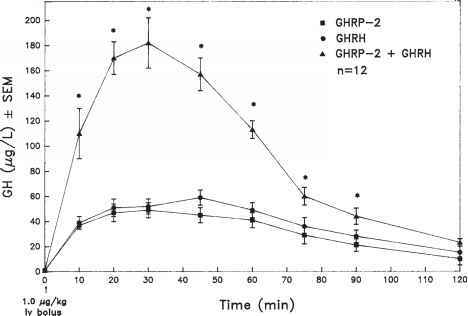 Comparative effects on the GH release to 10 ^g/kg sc high dose GHRP-2 vs 1+1 ^g/kg iv bolus GHRP-2+GHRH in the same nine normal young men. Reproduced with permission from ref. 81.
release GH by inhibition of SRIF release or by attenuation of the SRIF inhibitory action on the pituitary. Although GHRP can be categorized as a functional SRIF antagonist at the pituitary and possibly the hypothalamic level (66,67), such a small dose of GHRP-2 would be unlikely to attenuate the pituitary or hypothalamic action of SRIF. A seemingly convoluted issue is to what degree is it possible to relate the hypothalamic action(s) of exogenous low dose GHRP-2 and a putative endogenous GHRP-like hormone. Because it has been impossible to explain the synergistic release of GH by a very low dosage of GHRP-2 via a hypothalamic action on the release of GHRH or SRIF, it has been hypothesized that a third factor designated U-factor mediates this synergism. U-factor is envisioned to be released from the hypothalamus via the action of GHRP. In concert with GHRH and sometimes with GHRP when higher dosages of GHRP are administered, U-factor acts on the pituitary to synergistically release GH, seemingly by a complementary intracellular signal transduc-tion action and in part by possibly attenuating the pituitary inhibition of SRIF on GH release. 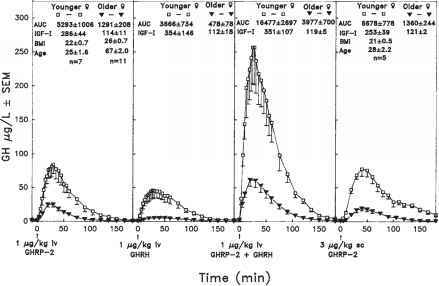 A seemingly general valuable point is that GHRP studies alone and in combination with GHRH in humans can reveal new dimensions about the secretion of GH, as well as add new insight into the actions of GHRP. Another dimension of the action of GHRP-2 on GH release was revealed when a large dose of 10 ^g/kg was administered sc to normal young men (Fig. 9) (65). 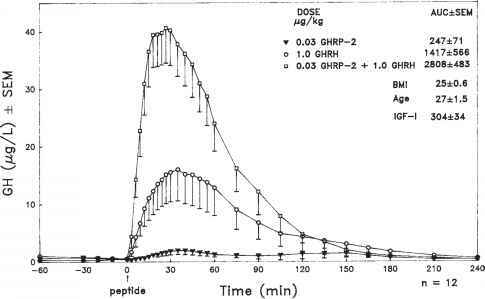 Because this large dose of GHRP-2 alone released the same amount of GH as that induced by iv bolus 1+1 ^g/kg GHRP-2+GHRH, GHRP-2 in this high dosage was considered to release endogenous GHRH from the hypothalamus and, in this way, release a large amount of GH possibly via the synergistic action of GHRP + endogenous GHRH. Fig. 10. Comparative effects on the GH response to GHRP-2, GHRH, and GHRP-2+GHRH in the same normal younger and the same normal older men. Three ¡¡g/kg sc GHRP-2 (last panel) was administered to these subjects, with the exception that there were only 5 of 7 younger female subjects. Fig. 11. Comparative effects on the GH response to GHRP-2, GHRH, and GHRP-2+GHRH in the same normal younger and the same normal older women. Three ¡¡g/kg sc GHRP-2 (last panel) was administered to these subjects, with the exception that there were only 5 of 7 younger female subjects. Fig. 12. 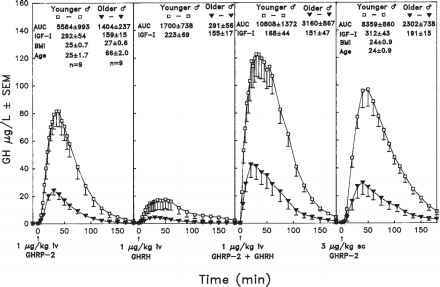 GH responses over time with administration of iv GHRH (1 ¡¡g/kg), GHRP-2 (1 ¡g/kg), and GHRH+GHRP-2 (each at a dose of 1 ¡g/kg) in children with GH insufficiency. Mean ± SEM. Reproduced with permission from ref. 69.
dosages of GHRH even in the older subjects, indicating the pituitary capacity to release GH is not the reason the GHRH GH response is lower in older subjects. GHRPs are very effective in children. When Pihoker et al. (69) acutely administered GHRP-2+GHRH to short-statured children with various degrees of GH deficiency, GH was synergistically released (Fig. 12). In these children, GHRP-2 alone very effectively released GH. Three separate chronic studies by Laron et al. (70,71), Pihoker et al. (69,72) and Mericq et al. (73) have been performed with hexarelin or GHRP-2 administered intranasally or subcutaneously to short-statured children with partial GH deficiency. In each study, the height velocity was increased by 2.5-3 cm/yr. The results recorded in Fig. 13, obtained by Pihoker et al., indicate that after 6 mo of intranasal GHRP-2 administration 2-3 times/d, the GH response was not desensitized and tended to be increased or up-regulated. Since 1993, Casanueva and Dieguez et al. (74) have performed a series of important studies with GHRP-6 in patients with obesity, Cushings syndrome, and hypothalamic-pituitary disconnections. 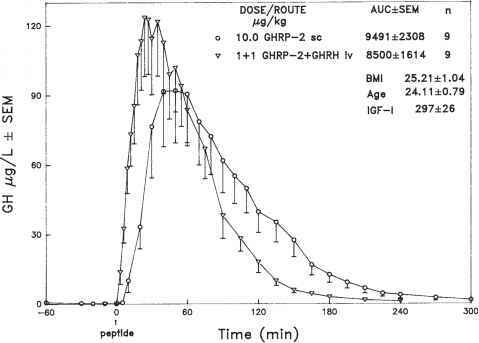 In obesity, GHRP released a remarkable amount of GH, especially when GHRP-6+GHRH was administered. The GH response to GHRP-6 alone and together with GHRH was markedly decreased in Cushing's syndrome. In patients with a hypothalamic-pituitary disconnection, GHRH released a normal amount of GH and GHRP-6 a lesser amount. These results indicate new dimensions in the secretion of GH and eventually understanding them in more detail will reveal new insight into the physiological and pathophysiological secretion of GH in humans. Also, other studies reveal that GHRP releases GH from pituitary tumors of acromegalic patients in vitro and in vivo (28,41,75,76).